Just when you thought the world of Metro 2033 couldn't get any darker, the achievements stop working. A patch supporting the new Ranger Pack DLC for gritty, post-apocalyptic shooter Metro 2033 seems to have done something strange to the new achievements the pack brings, so that they're not being awarded when they should. 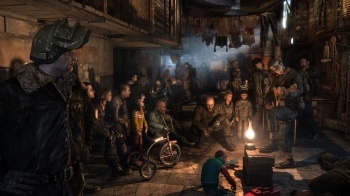 Gamers told THQ about the problem last week, but the publisher said on Metro 2033's official Twitter feed that the problem appeared to be something to do with Microsoft, rather than with the game itself. Earlier today THQ relayed a message from Microsoft, saying that if a player was having problems with the Ranger Pack, then recovering his or her gamer profile might help. Others are reporting that this doesn't really fix the issue however, and the new achievements disappear when the game starts up. In a statement to Joystiq, THQ said that it was investigating the problem with Microsoft, and expected to have a resolution shortly, adding that it hoped to have more concrete news to share soon. Hopefully this will get resolved quickly, because while some may roll their eyes at achievements, many more derive a great deal of joy from them, and Metro 2033 is the kind of game that makes you really earn them.